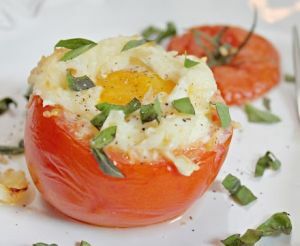 If you’ve got a summer harvest of tomatoes, I’ve got a great idea for you for breakfast. It will nourish you from head to toe, with one of the best antioxidant nutrients you can find, and it will provide a delicious meal of protein, healthy fats, and veggies. And, if you don’t have tomatoes in your backyard, I’m willing to bet that you know someone who does or your local grocer or farmer’s market carries tomatoes. Make these ahead of time for a quick grab-n-go option that will keep your body healthy and ready for your next ride. Preheat oven to 450 deg F. Line up tomato halves on a baking sheet. If they don’t stand well, slice a bit of the bottom off to make a stable tomato. Crack eggs and place one in each tomato. Season eggs as you’d like, with salt and pepper, spices, fresh onions & garlic, etc. Bake for 6-10 minutes, depending on how you like your eggs (6 for runny and 10 for soft set). for soft set. Remove from oven, top with fresh herbs, and allow to cool slightly. Serve on a delicious piece of toasted sourdough (here’s more about sourdough) or alongside a healthy whole-food carb such as a baked yam or piece of fruit. Enjoy! In case you missed my rant post on eggs and whether or not they are okay to eat, you can find it here. I believe they an be a healthy part of most any body’s diet, and are a delicious part of this breakfast. But this is summer, and we’re talking gardens, harvests, and farmer’s markets. Tomatoes are the star this week. Fresh or canned, and especially organic, tomatoes have a lot to offer. Most notably, they are high in lycopene. Lycopene is a carotene. But, unlike other carotenes, it is not chemically altered into an active form of Vitamin A in the body. This is actually very beneficial since it allows lycopene to have unique, very powerful antioxidant action in our cells that other carotenes do not offer (which is a good reason to eat a variety of colorful fruits and vegetables to get a lot of different carotenes and other nutrients). There have been a lot of human studies done on lycopene – it has been shown to be protective of healthy cells and inhibitory to unhealthy cells (such as cancer cells). While much of the research is inconclusive at this point, lycopene’s benefits are potentially as far-reaching as promoting heart health, reducing cancer risk, reducing Diabetes, reducing cholesterol, and reducing inflammation. In fact, as an antioxidant, test tube studies have shown it to be 125 times as powerful as vitamin E! To get the most of your tomatoes, use organic whenever possible – they usually contain significantly higher amounts of lycopene. Onions and garlic are no slouches either. Onions provide detoxifying benefits (at a cellular level) as they are high in sulfur and garlic is wonderfully beneficial for heart health. Last but not least, fresh herbs like basil and cilantro leaves or coriander seeds (they are from the same plant) provide disease-fighting phytochemicals, antibacterial compounds strong enough to fight salmonella, cholesterol-lowering agents, blood sugar stabilizers, and free radical fighters to keep our cells young and healthy. Not bad for a simply herb, huh? Wow, I think we just put a lot of other breakfasts to shame. Rotate this with Overnight Chia Oats and/or delicious Smoothies and the most important meal of your day is golden. Whatever you choose, I recommend protein, vegetables, and a healthy whole-food carb to start your day (omitting carbs at dinner, when you no longer need the energy is better than omitting at breakfast for most athletes). What’s your favorite way to accomplish this? Breakfast just got an upgrade. Start your day right and stay healthy so you can ride another day!